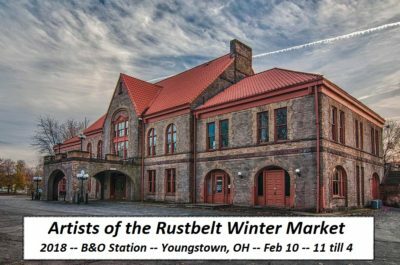 Winter Market at the B&O Station - Carmichael Inc.
Carmichael will be set up at the 2018 Artists of the Rustbelt Winter Market at the B&O Station in Youngstown, OH on February 10 from 11 AM till 4 PM. Don’t miss this show if you’re shopping for a special gift for Valentine’s day. There will be a large variety of artwork and handmade gifts from local artists. There will be food available and the B&O Station bar will be open for those that want an adult beverage to sip on. There’s plenty of parking right outside the station. Now that the holiday shopping rush is over, come on out and shop for yourself !! Come get that special piece you know you wanted but just held out. We will have a nice selection of handmade jewelry, accessories, and silverware sculptures available for purchase at this event. FYI – We’ve started casting some metal items. Usually we bring out our new items as well as customer favorites to these shows.